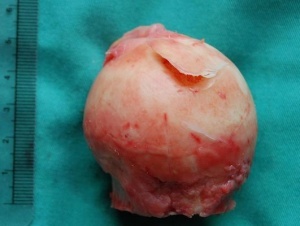 Avascular necrosis of the femoral head, also known as osteonecrosis, although this term isn’t used that much anymore, is characterized by variable areas of dead trabecular bone and bone marrow, extending to and including the subchondral plate. Most of the time it is the anterolateral region of the femoral head that is affected but no area is necessarily spared. This disease is often seen in patients in the third, fourth and fifth decade. The older the patients, the less the chance of revascularization. We can also state that most radiographically evident lesions progress until the femoral head collapses . The earliest sign of this mechanical failure is the crescent sign, which represents separation of the subchondral plate from the underlying necrotic concellous bone. After the femoral head has collapsed, most patients have clinical progression resulting in the need for a total hip replacement . The pathophysiology of avascular necrosis of the femoral head has not been completely accounted for. In some patients there has clearly been a direct cause (trauma, radiation,..), while in others the pathophysiology is still uncertain. 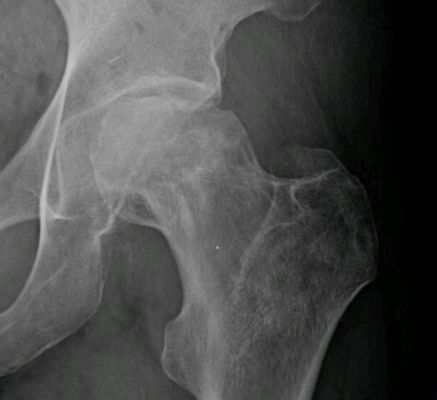 Avascular necrosis of the femoral head has often been described as a multfactorial disease. It is associated in some cases with a genetic predilection as well as an exposure to certain risk factors. The most common risk factors are: corticosteroid intake, alcohol use, smoking and various chronic diseases . Patients with human immunodeficiency virus are also at higher risk for the development of avascular necrosis of the femoral head. It has to be noted too, that osteonecrosis is a (rare) complication of pregnancy. Many of these cases are initially misdiagnosed as transient osteoporosis of the hip. It is very important that avascular necrosis is diagnosed early in the disease process since the success of the treatment is related to the stage at which the treatment starts. Patients are often seen because of pain in the groin, but symptoms can also radiate to the knee or buttocks. On examination, there is usually a painful range on motion, especially on forced internal rotation. It is also important to track any risk factors before the start of the examination. 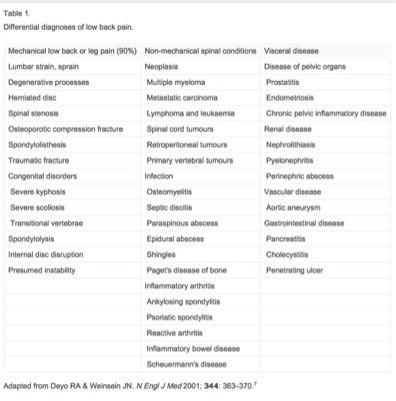 Investigators need to be wary of avascular necrosis in any patient who has pain in the hip, negative radiographic findings and any of the risk factors, described above. 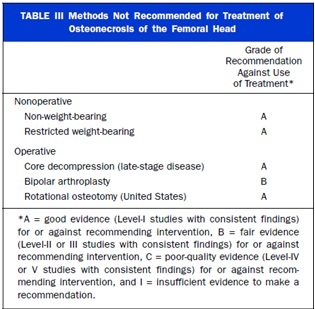 The other hip must also be evaluated. When standard anteroposterior and frog-leg lateral radiographs show obvious avascular necrosis of the femoral head, it is not necessary to perform an MRI. This is the best method for cases that are radiographically occult or not obvious on radiographs. It has been found to be 99%sensitive and 98% specific for this disease. This method is believed to slow the progression of avascular necrosis so that the femoral head wouldn’t collapse. 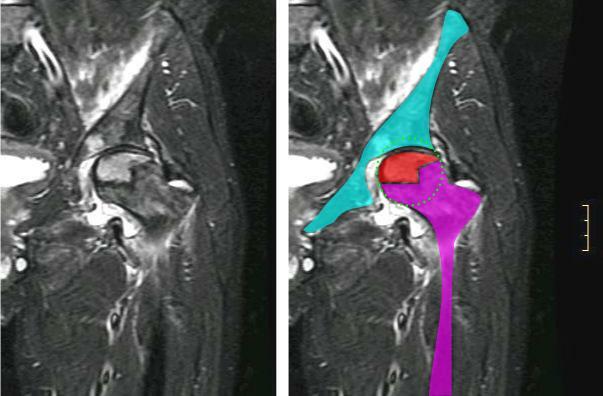 However more than 80% of affected hips do progress to femoral head collapse and arthritis by four years after the diagnosis. There are various methods to reduce weight-bearing. The concept of this method is to reduce the forces on the hip joint. This (interventional) treatment has various modalities, such as a cane, crutch, walker or two crutches. Most studies have shown though that non-operative treatment yields poor results. The only condition for which protected weight-bearing might be effective is a type-A lesion. Electrical stimulation has been shown experimentally to enhance osteogenesis and neovascularization as well as to alter osseus turnover. 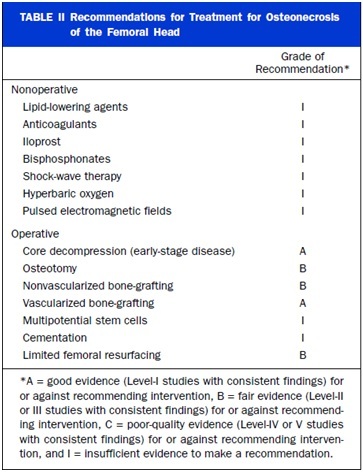 There are several possible ways to treat avascular necrosis of the hip: core decompression, Core decompression with electrical stimulation, Osteotomy, Non-vascularized bone-grafting and Vascularized grafts.